Interesting interview. I particularly liked how you handled the Codex's standard complaint ("it's not an RPG if the player's own skills are used") by first making a distinction between intellectual and physical abilities and then utilizing a tabletop analogy to support your argument. New perspective, user-made modules will be available on the website, and the toolset sounds great so far! I can't believe it. All the news about KoTC 2 sound so great, it can't be true! I guess that for a given adventure, the module designer should specify the maximum party size so that difficulty is not thrown widely out of kilter. One thing I'd like to mention: It would be great if you could restrict the party size to eg. 4 to allow 2 NPCs to join the party for quests etc. Great interview. Hey, I was just wondering... a lot of your focus seems to be on the engine upgrade and gameplay aspects for KotC2. Have you been working on the story/background for the next adventure? I don't expect you to reveal details, but was just curious how that was coming along. Although fairly straight-forward, I like how the plot unfolded for the first Knights of the Chalice. And the NPCs and villains met were a nice combiniation of amusing and interesting. I really hated Kessa, which made her downfall all the more enjoyable! Have you been working on the story/background for the next adventure? Not yet, there's just too much programming to do right now for me to think about the story. Also, since it will allow modules, I'll probably do several smaller adventures rather than a single big one. No doubt, some of them will involve evil cults with human sacrifices and horrifying villains... Something like the picture below maybe, can you guess where it comes from? I really hated Kessa, which made her downfall all the more enjoyable! Exactly, I also feel that way about Dagolar in Dark Sun Shattered Lands (and generally all templars in the Dark Sun setting) and Irenicus in Baldur's Gate 2. Don't recognize the picture, although it looks like something from the Aztecs or Mayans. When you first mentioned ritual sacrifice, I thought of Indiana Jones and the Temple of Doom. I like the idea of a modular structure. That seems to have more of a pen and paper flavor, than one massive epic story. 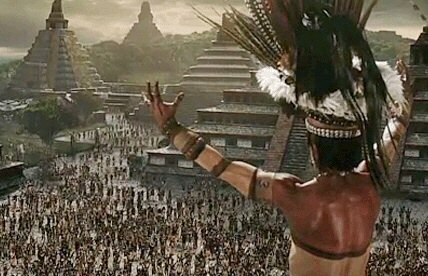 It's from Apocalypto. Great film! The modular structure can also resolve a lot of the issue with balancing the game for higher level PCs. For example in KotC you could be doing the Frost Giants at various levels and depending on that the game would be easier or harder, but a Frost Giant module would require you to be around level 14. Knights of the Chalice has received a five-star rating from GearDownload.com. Demiath wrote: Interesting interview. I particularly liked how you handled the Codex's standard complaint ("it's not an RPG if the player's own skills are used") by first making a distinction between intellectual and physical abilities and then utilizing a tabletop analogy to support your argument. I disagree though. I just played Drakensang: The River of Time, which is much better than the first one, and this game does it exactly right. The char system is great and all skills are useful, a quest might have different solutions or approaches and the skills of the characters get used to determine the outcome. Didn't invest enough in Persuade/Haggle/Seduce or whatever- you'll most likely fail your roll. If you always let the player decide what he wants to choose, the character skills become meaningless and you might as well remove them completely, as KotC did. Removing the meaning of a whole part of the character building - a step in the right direction? I don't think so. Of course you do - you're a High Priest from the Church of RPGCodex, after all . Me, I'm perfectly fine with a lot of RPGs being heavily stats-based in terms of the social skills, but there ought to be room in the genre for developers who instead choose to handle the specifically "intellectual" abilities through player skills, and BlueSalamander outlined a useful way to think about it. Didn't invest enough in Persuade/Haggle/Seduce or whatever- you'll most likely fail your roll. It may well work in Drakensang: The River of Time, but I don't think it would work well in KotC 2. Surely if these skills are important in the game (as much as other elements like healing magic or melee firepower), you're going to have one character in your party that has most of the skills. For all the other characters, the skills will be irrelevant; in fact, it will be annoying having to choose skills for them at level up. That's why in AD&D, only the thief had skills and skill points, the other classes had none. If there is a class with skills, like the bard, most of the time you'll want to have a bard in your party just to keep your dialogue options open; so in fact you're reducing your party creation options. I'm just saying: put whatever class/race you like in the party, it won't close your dialogue options.